Happy 4th Anniversary to us, the bodacious, brazen,wine and whiskey drinking, bread-centric Bread Baking Babes! 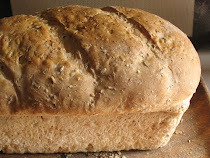 As the Bread Baking Babes gather around the kitchen table of Lien of Notitie Van Lien blog, our kitchen of the month, we are exploring another type of bread, appropriately spicy in celebration of 4 years of bread baking fun. Although I have not had the pleasure of being a Babe the whole time, I can tell you that this group of sassy women are good to each other, opinionated in the best of all ways, always up for a bread baking challenge and intensely individual. About the only rule is the one to e-mail the kitchen of the month hostess if you want to be a Buddy. I just wish all groups were this much fun. This month we are baking Biscotti Picanti (Sicilian Spicy Rusks), a specialty of Castelvetrano in Sicily. The recipe is from Savory baking from the Mediterranean - by Anissa Helou. 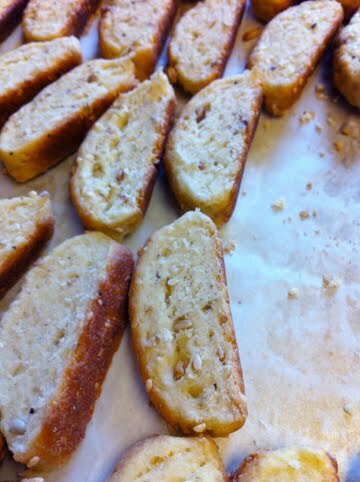 Crunchy and just a bit crumbly is a good description for these savory biscotti. Up to now I've only had sweet biscotti cookies, twice baked and dry and none of them has had any yeast in them. This savory version does have yeast. It also has seeds; both the sesame seeds called for in the recipe and a seed mix from King Arthur flour that I used instead of the anise seed since I'm not a fan of that flavor. I also substituted a couple of tablespoons of Meyer Lemon olive oil for some of the olive oil so these have a nicely citrus, seedy flavor, given just a hint of heat from the freshly cracked black pepper. These are delicious with wine. I served them with the wine I used to make them, a Kenwood Pinot Grigio. Although these keep well because they are dry, I suspect you'll find that they are too delicious to last long but don't worry...they are easy to make, too. 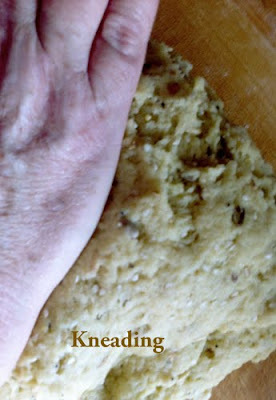 I loved the feel of the dough...very easy to knead with all of that olive oil in it. The smaller biscotti from the ends of the logs were just a bit crisper than the others, which is something that Sweetie loves. I'm sending these over to Susan at Wild Yeast this week. Do check it out. 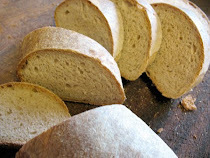 Yeastspotting, the weekly forum she provides, is a fantastic collection of yeast based recipes for bread, both sweet and savory. Also, do check out the post of these delicious biscotti a the rest of the Bread Baking Babes' sites. Links can be found at the right. 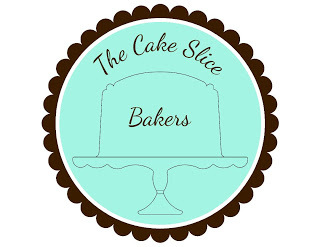 Last, but not least, be a Buddy by baking these, and then sending a photo and description of your baking experience via E-MAIL to Lien at notitievanlien(at)gmail(dot)com by February 29th to be included in the round-up. Looking forward to seeing your take on this delicious snack. 1. Dissolve the yeast in ( ¼ cup/60 ml) warm water and stir until creamy. 3. Add yeast, wine and (½ cup (115 ml)) warm water en knead briefly to make a rough ball of dough. Knead this for another 3-5 minutes or so. Cover and let rest for 15 minutes. 4. 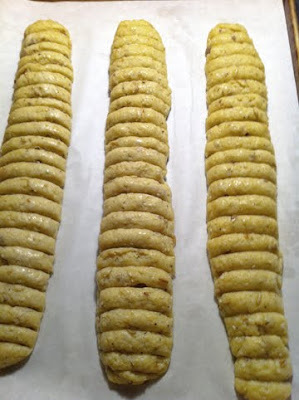 Divide the dough in 3 equal pieces and shape each piece into a loaf about 12”( 30 cm) long. Transfer the logs to a baking sheet lined with parchment paper and leaving at least 2 inches/5 cm between them so they can expand. Take a dough cutter (or sharp knife) and cut the loaves into 1 inch/2,5 cm thick slices (or if you prefer them thinner in 1"/1 cm slices). Cover with greased plastic and let the rise for about 45 minutes. Lovely! I like your addition of the Meyer lemon olive oil. Inspired! Cheers Elle! 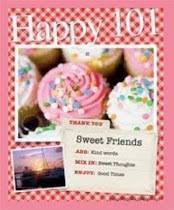 On the biscotti and many happy returns! Awesome ... lemon! You are a marvel. And that "opinionated in the best of all ways, intensely individual" so right on and such a good smile it brings. Happy anniversary to us ... could you share some of that lemon cake to, I'm sure I could find a spot for a nice slice! Looks beautiful. What a good idea to add a splash of Meyer lemon oil, Elle! 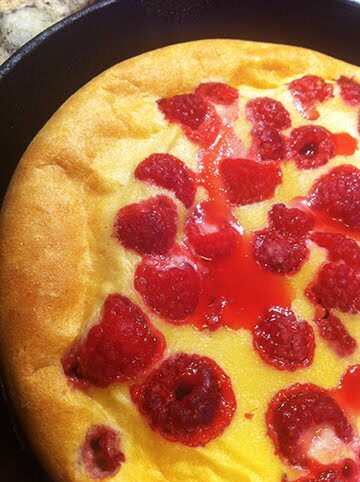 And did you sneak some lemon zest in as well? Heather, I can't wait to see your rendition...it is sure to be excellent! Natashya, these really were delish, weren't they, Meyer lemon olive oil or not. Elizabeth, Yes, there was some zest, too. Did I forget to add it? Just a teaspoon of zest added to the flour. Well I can only agree with the others... a stroke of genius to put lemon oil in them. Real Sicilian too. Happy anniversary Babe!! Happy Anniversary! Red wine and a bit of ham.... maybe some goat cheese. Or white wine and..... Endless possibilities!